An exciting adventure for boys and girls 7.5 years to 10.5 years. Cub Scouts have a lot of fun doing a lot of interesting things! There are games to play, codes and skills to learn, places to see and new friends to meet. Cub Scouts all help each other, and try to help other people too. As a Cub, you will get together with other boys and girls your age and be led into adventure! 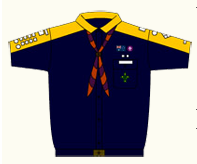 You’ll wear your own Cub Scout uniform to show you’re one of us. And you’ll be able to collect special badges to put on your uniform to show your achievements. We spend weekends away together camping, fishing and exploring. We go to sports meetings, visit factories, go to the zoo, the museum, or the fire department headquarters. We learn bushcraft, and we learn how to fly model aeroplanes. One of the boys or girls in your group will be your `Sixer’ (a bit like the Captain of your school sports team). You’ll know your Sixer by the two yellow stripes worn on their left pocket. The Sixer often has a `Second’ as a helper (a bit like a Vice-Captain) who wears one yellow stripe. You too could eventually wear these stripes one day and become a Sixer or a Second of your Pack.